What's the point of peer review (in reference to Marc Haber et al. 2012)? R1a1a-M17 diversity declines toward the Pontic-Caspian steppe where the mid-Holocene R1a1a7-M458 sublineage is dominant . R1a1a7-M458 was absent in Afghanistan, suggesting that R1a1a-M17 does not support, as previously thought , expansions from the Pontic Steppe , bringing the Indo-European languages to Central Asia and India. OK, first of all, the authors made a glaring error in claiming that R1a1a7-M458 dominates the Pontic-Caspian Steppe. It most certainly does not, and this information is available in the paper they referenced (Underhill et al. 2009). Secondly, who cares about R1a1a STR diversity? It's not relevant, because it tells us nothing about the origins of R1a1a. In fact, there's no way anyone can accurately estimate the ages/expansion times of Y-chromosome haplogroups. Scientists have attempted such feats on many occasions in recent years, and often came up with ridiculous results. So perhaps it's now time to admit there's a problem and move on? I'd say there's no reason why R1a1a7-M458 should be present in Central Asia and India. 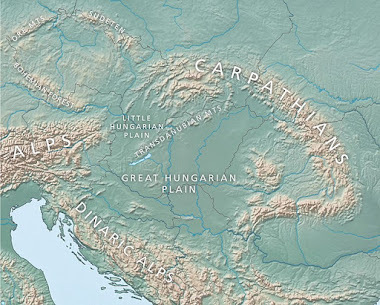 Simply by looking at its modern distribution and frequencies, without even attempting any complex calculations, it seems to have expanded around East Central Europe well after the early Indo-European dispersals (see here). The most sensible claim anyone can make about R1a1a7-M458 is that it's a Slavic, or even West Slavic marker, that probably originated in the people who would become Slavs in or near modern-day Poland. The European-specific R1a1a SNP that scientists should be looking for in Central Asia, in order to track the movements of the early Indo-Europeans, is Z280. This marker has a much wider distribution in Central and Eastern Europe than M458, and perhaps that was also the case during the relevant time frames - the Chalcolithic and early Bronze Age? Indeed, it has already been found in native Central Asian samples, both in private and academic tests, and the latter results will hopefully be published soon. To widen the net, they should also test for Z283, which is upstream to both M458 and Z280. Its present distribution hints that it might have been a common marker within the late Neolithic Corded Ware cultural horizon of the North European Plain, which is usually thought of as an early Indo-European culture. If that was the case, then in theory, based on archeological data, it might have traveled with representatives of the Eastern Corded Ware, the Abashevo culture, past the Urals and as far as East Central Asia. For a long time, it was generally accepted that Europeans were direct descendants of Palaeolithic settlers of the continent, with some Middle Eastern ancestry in the Mediterranean regions, courtesy of Neolithic farmers. However, in the last few years, largely thanks to ancient DNA, it dawned on most people that such a scenario was unrealistic. It now seems that Europe was populated after the Ice Age in a big way, by multiple waves of migrants from almost all directions, but especially from the southeast. Getting to grips with the finer details of the peopling of Europe is going to be a difficult and painstaking process, and will require ancient DNA technology that probably isn’t even available at the moment. However, the mystery about the basic origins and genetic structure of Europeans was solved for me this week, after I completed a series of ADMIXTURE runs focusing on West Eurasia (see K=10, K=11, K=12, and K=13). The map below, produced by one of my project members, surmises very nicely the most pertinent information from those runs (thanks FR7!). It shows the relative spread of three key genetic clusters, from the K=13, in a wide range of populations from Europe, North Africa, and West, Central and South Asia (i.e. the data represents the nature of West Eurasian alleles in the sampled groups, with only three clusters considered). 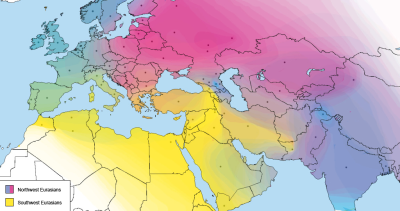 The yellow cluster is best described as Mediterranean or Southwest Eurasian, while the cyan and magenta, which are sister clades, as Northwest Eurasian. Thus, it appears as if modern Europeans are made up of two major Neolithic groups, which are related, but at some point became distinct enough to leave persistent signals of that split. They spread into different parts of Western Asia before moving into Europe. The Southwest Eurasians, possibly from the southern Levant, dominated the Mediterranean Basin, including North Africa, Southern Europe, and the Arabian Peninsula. I’m pretty sure that Otzi the Iceman is the best known representative of the ancient Southwest Eurasians (see here). 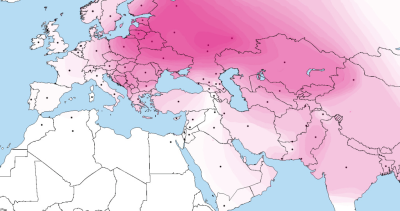 The Northwest Eurasians might have originated in the northern Levant, but that’s a pure guess. In fact, judging by the map above, their influence isn’t particularly strong in that part of the world today, and only becomes noticeable several hundred kilometers to the north and east, in the North Caucasus and Iran respectively. However, the northern Levant is actually dominated by a fourth West Eurasian cluster, tagged by me as "Caucasus" in the K=13 run, and not shown on the map above. Various calculations show that this can also be assigned to the Northwest Eurasian group, except that it seems to have split from the other Northwest Eurasian components at an early stage (see comments section here). After their initial spread, it appears as if the Northwest Eurasians inhaled varying amounts of native Mesolithic groups in their newly acquired territories west, north and east of the Levant. This is being strongly suggested by the aforementioned ancient DNA results, at least as far as Europe is concerned. They also mixed heavily with Southwest Eurasians in Europe and nearby. That’s why, for instance, you’ll never find an Irishman who clusters closer genetically to an Indian than to other Europeans. However, even a basic analysis of their DNA, like my own ADMIXTURE runs, shows that a large subset of their genomes comes from the same, relatively recent, “Northwest Eurasian” source. We can follow the same logic when talking about the differentiation between modern descendants of Southwest Eurasians. For instance, those in Iberia have significant admixture from Northwest Eurasians, while those in North Africa carry appreciable amounts of West and East African influence. I’m convinced that the scenario of the peopling of Europe outlined above, by two basic stocks of migrants from Neolithic West Asia, is the only plausible one, because the signals from the data are too strong to argue against it. I’m sure you’ll be seeing the same story told by scientists over the next few years in peer reviewed papers. They’ll probably come up with different monikers for the Southwest and Northwest Eurasians, but the general concepts will be the same. However, that was the easy part. The hard part is linking the myriad of movements of these Southwest and Northwest Eurasians with archaeological and linguistic groups. Perhaps the earliest Southwest Eurasians into Europe were Afro-Asiatic speakers? To be honest, I have no idea, because that’s not an area I’ve studied closely. But I would say that it’s almost certain that the proto-Indo-Europeans were of Northwest Eurasian stock. It’s an obvious conclusion, due to the trivial to non-existent amounts of Southwest Eurasian influence in regions associated with the early Indo-Europeans, like Eastern Europe and Central Asia. Perhaps the simplest and most diplomatic thing to do for the time being, would be to associate the entire Northwest Eurasian group with an early (Neolithic) spread of Indo-European languages from somewhere on the border between West Asia and Europe? I know that would work for a lot of people, specifically those who’d like to see an Indo-European urheimat in Asia, as opposed to Europe. But it wouldn’t work for me, especially not after taking a closer look at that map above. As already mentioned, the Northwest Eurasians can be reliably split into two clusters, marked on the map in cyan and magenta. I call the cyan cluster North Atlantic, because it peaks among the Irish and other Atlantic fringe groups, and the magenta Baltic, because it shows the highest frequencies among Lithuanians and nearby populations. The story suggested by the map is pretty awesome, with the Baltic cluster seemingly exploding from somewhere in the middle of the Northwest Eurasian range, and pushing its close relatives to the peripheries of that range. Thus, under such a dramatic model, the North Atlantic is essentially the remnant of the pre-Baltic Northwest Eurasians, and appears to have found refuge in Western and Northwestern Europe, in the valleys of the Caucasus Mountains, and in South Asia. Indeed, there seems to be a correlation between the highest relative frequencies of the North Atlantic and regions that are still home to non-Indo-European speakers, or were known to have been home to such groups in historic times. For instance, France has the Basques, while the British Isles had the Picts, who are hypothesized to be of non-Indo-European stock. Note also the native, non-Indo European speakers in the Caucasus, like the Chechens, who show extreme relative frequencies of the North Atlantic component. Moreover, at the south-eastern end of the Northwest Eurasian range, in India, there are still many groups of Dravidian speakers. Below are two maps that isolate the relative frequencies of the North Atlantic (cyan) and Baltic (magenta) components, versus each other and the Southwest Eurasian cluster, to better show the hole in the distribution of the North Atlantic. To be sure, this North Atlantic can be broken down further, but only with more a comprehensive sampling strategy, especially of Northern and Western Europe.